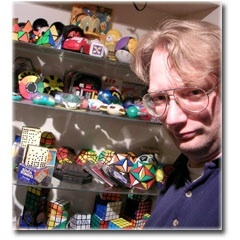 March 11, 2010 : Interview with Speedsolving.com member Jaap Scherphuis : Jaap is one of the biggest puzzle collectors in the world, and is creator of Jaap's Puzzle Page, which contains one of the most comprehensive guides to puzzles of all kinds (created in 1999). You can read more about him on his about page. What is your favorite puzzle, why? Apart from the 3x3x3, obviously, it's a toss-up between the Rubik's Magic and Lights Out. I love the way Magics move, and the all the different shapes that are possible with it. I am fascinated by Lights Out because of the amazing amount of mathematics behind it, from straightforward linear algebra to deep, not yet understood parts of maths that are still waiting to be explored. I have a stack of printouts of maths papers related to Lights Out that is two inches thick. As far as I can remember, I have always been interested in mathematical puzzles. I was 8 or 9 when the Rubik's Cube first came out, and got one as a present. Around the same time I also got my first proper maths puzzle books, Martin Gardner's Mathematical Puzzles and Diversions, and Henry E. Dudeney's Amusements in Mathematics. How many puzzles do you own, and of those, how many were you able to solve without any outside help? I have no idea how many slidy/twisty puzzles I own, I don't keep track. It is probably somewhere between 700 and 1000. My first cube came with a solution booklet. I was too young and impatient to resist, so I never worked out the solution myself. The Barrel was my second puzzle, and I used a booklet on that as well when I didn't understand how a single piece could be flipped. I kicked myself for not realising how that worked. The Pyraminx, Orbit, and Alexander's Star I then did without help. When the 4x4x4 cube came I managed to solve it all by myself, stupidly by devising a layer by layer method, except for the edge parity. It was only many years later that I knew what caused parity and how to fix it. All the puzzles after that I solved without help, though there have been several occasions where I solved a puzzle by writing a computer program to solve it for me. Which puzzle has given you the given you the greatest challenge? The biggest solving challenge for me was the Square-1. It took me a few months to figure out, and it is the first for which I really needed computer help. I wrote a program that searched for move sequences that moved only a few pieces. Unfortunately, the only things it spat out were even permutations, so there was no short parity fix. Eventually I managed to use the computer to turn a parity fix that moved nearly all the pieces into one that moved only 6 edges. At the time I was writing up my solutions in a filofax, but with all the many new move sequences I was finding, I decided to put it up on a website. Are there any puzzles you have been unable to get hold of that you would like? In the last year I got hold of two that I had been looking for for years - Crossover by Nintendo, and the Dino Star. There are about ten I'm still looking for, but I won't tell what they are since they are so rare and little known that I don't want to draw attention to them. All the cubing events I've been to have been very enjoyable. The Dutch Cube Day is always a fantastic event, and every year I think I won't buy much, and am happy to be proved wrong. The 2003 World Championships was I think the most enjoyable, because it was the first international event I went to. I still find it hilarious that I won the Rubik's Clock event there. I watch a lot of DVDs, especially those with a lot of extras. I have about 800 items, very few of which are vanilla editions. I used to read a lot of science fiction, and do some magic, but nowadays computer programming, puzzles, and DVDs take up most of my spare time.